The story: Based loosely on a play by George Bernard Shaw, "The Millionairess" is the tale of a spoiled young heiress, Epifania (Sophia Loren), who is unlucky in love. She meets the quiet, altruistic Indian doctor Kabir (Sellers) and decides this good-hearted man is for her, but she has to follow conditions in her father's will that her future husband be able to make vast sums of money. Hijinks ensue. Who's Sellers: In what would be a dry run for his Indian character in "The Party" a few years later, Sellers is Kabir, a humanitarian doctor who doesn't care about money and who finds Epifania's ostentatious wealth offputting. Playing the straight man, Sellers is a bright spot in a rather plodding movie, as he makes Kabir genuinely kind and sincere, yet a bit too idealistic to be believed. But the comedy in the movie is left to a rather shrill Loren, and his character is shoehorned into a totally unconvincing romance that never comes off. Notably, in "real life" Sellers became obsessed with the gorgeous Loren, ruining his first marriage over her. It's a shame that obsessive chemistry never really shows on screen. So how is it: A rather big misfire, one of those self-conscious movies where abrasive is confused with quirky. While Loren is fun to look at and utterly gorgeous, her character is a hugely unappealing spoiled brat, and Sellers is so damped down as the upright doctor that he barely registers sometimes. 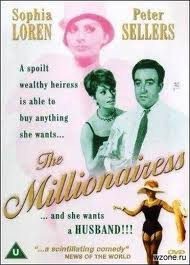 There's few things more disheartening than a romantic comedy where two actors with very little chemistry acting in highly melodramatic ways are shoved down an audience's throats, and that's what "The Millionairess" is. There's some moments that are amusing -- Epifania heads into a dingy sweatshop and manages to turn it into a hugely successful business in about ten minutes, and there's an enormously risque scene for 1960 where Loren strips down to her undergarments -- but the overall sluggish pace and a hit-you-over-the-head message that "money isn't everything" make this one a bit of an ordeal to sit through today. Not Sellers' best by a long shot. Epifania Parerga: "You don't understand, I'm killing myself." Dr. Ahmed el Kabir: "Well, it is our common destiny, good day." It's kind of embarrassing to admit but my game of choice on my fancy new hi-tech iPhone 4 hasn't been some flashy God of War type digital extravaganza, but instead a rather charmingly poky 20-year-old Sega videogame, Sonic The Hedgehog. 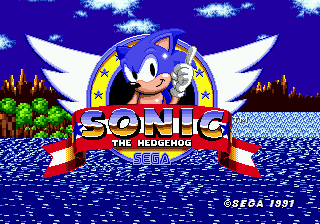 I stumbled across an app download that exactly duplicates the 1991 version of Sonic, spent my $2 and was hooked, drawn in again into the land of spinning rodents and magical gold coins where I whiled away much of a summer away from college playing. Perhaps age 19 is the perfect time to spend a summer playing videogames. I've got to admit the videogame revolution of the past two decades has mostly passed me by, and my joystick skills pretty much ended with Sega Genesis and Nintendo games in college. We don't own a PlayStation or a Wii or a Kinext or whatever they're called; I've thought about it, but I get kind of addicted to these things and I *know* 7-year-old Peter gets hooked on 'em, and it wasn't until the last couple of years I really had the spending money to buy big videogame setups anyway. The iPhone is giving me a chance to check some of the newer games out (go Angry Birds!) but, well, I tend to find stuff like Mortal Combat IV kind of... boring. I've just never been a huge fan of the shoot 'n' kill lots of things school of games. Now, my true videogame addiction days peaked around 1983 or so with the beloved Atari 2600, which was in every '80s child's home. These games were hopelessly clunky by today's standards -- a square red dot is a knight with a sword? But your imagination filled in the technical limitations marvelously, turning "Yar's Revenge" into a sweeping galactic struggle or the hopelessly primitive castles and dragons of "Adventure" into a derring-do epic. My brother and my friends would crouch around the Atari for hours playing stuff like "Raiders of the Lost Ark," as it bleep-blooped away. Maybe that whole recapturing childhood thing is why I'm enjoying going all retro with Sonic The Hedgehog, as the little Sega critter, while more advanced than the Atari 2600, is still pretty crude compared to some of the other slick modern games I've seen. But he's familiar, and while it may not quite have 3-D reality, the goofy little world of Sonic is still pretty exciting by my undemanding videogame standards. ... So I haven't been blogging as much as I once did, because, well, blogging is on the wane, says The New York Times, so it must be true. After some initial trepidation, I have to admit I've been spending a bit of time on trendy Twitter, while Facebook is also one of my frequent haunts. But as I approach the end of year 7 (!!!) of blogging here, I don't imagine i'll entirely give it up in the near future. Twitter is specious, fluffy and highly short attention span -- but it's also a valuable news and networking tool, as I particularly noticed during the Christchurch earthquake down here last month. Yet I do like to ramble on for longer than 140 characters as well, so my aging Spatula Forum still has its place, even if I only get on here four or five times a month now. I don't see any need to give up one platform in favour of another. Part of the digital world these days is sorting out all the noise and figuring out what tools work best for you. The landscape changes very, very fast online these days. What was hip a year ago can become forgotten overnight (hey, remember MySpace or LiveJournal?). I picked up my first iPhone the other day, and it is a fantastic, utterly addictive tool -- just 10 years ago it would've seemed something out of science fiction that I could download, say, the works of Shakespeare in an app for free and have it in my pocket. I'm a creaky old gent of nearly 40, and it's hard to imagine what tech will be considered everyday when little Peter is my age. 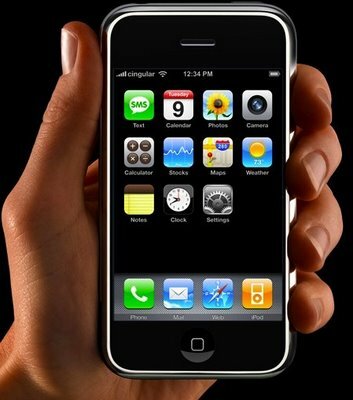 My iPhone 4 will likely seem a charming antique (unless of course our ape overlords have taken over by then). As a sign of the times I'm starting a new job next month too -- diving wholeheartedly into the digital journalism realm which is where an awful lot of my industry is going. I'll be working for NZ's biggest newspaper web site and am quite excited about the bold new realms I'll be exploring. There's still a lot that "dead tree" newspapers still have to offer, but any journalist or media company that is ducking its head in the sand over this Internet "fad" is going to be facing extinction. On to the brave new world! The story: "Two Way Stretch" is set in a small British prison, where life is pretty comfortable for inmate Dodger Lane (Sellers) and his cellmates. They've worked the system so cozily that they even get daily deliveries of groceries. They're near the end of their sentences, and an old criminal chum hatches a cunning plot to have Dodger and pals break out of jail for one night, make a heist, and then sneak back into jail so they can have a perfect alibi. Who's Sellers? Dodger Lane, a small-time Cockney criminal with big dreams and oily charm, whose shameless toadying and ability to work the angles have given him a smooth time of jail. So how is it: As one of Sellers' earlier flicks, in "Two Way Stretch" he takes a bit of a back seat to a cast of colourful British supporting actors. There's no disguises or wacky slapstick to the extent you'd see in his later films, but "Two Way Stretch" is also a showcase for how well Sellers could fit into one character. Dodger Lane is an unrepentant criminal to the bone, a lazy, self-satisfied thief who's always looking for an easy fix, and Sellers, in his "heavy" stage, sinks right into the character. The scenes of how Lane and his jail cellmates have set up a cozy little nest, complete with tea services, are quite funny, and there are some great supporting turns. But "Stretch" is also a rather thin premise for a film; although it's quite short, it feels a bit padded. Sellers nearly has the film stolen out from under him by the late Lionel Jeffries as the constantly shouting Chief Crout, the hard-as-nails warder who takes over the undisciplined prison. Jeffries is a riot, all barely-contained rage, nearly choking on his lines. He's a prototype of R. Lee Ermey in "Full Metal Jacket," an authority figure driven mad by the slackness of his charges. 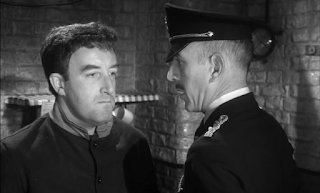 Some of the other actors don't do quite as well but Bernard Cribbins is also sly fun as the aged criminal disguised as a kindly visiting priest. All in all, though, it's a fun and breezy British crime caper. Back in the glorious 1980s of my youth, the comic book world seemed to be exploding with creativity. The independent companies were in full bloom, and the mainstream was hip-deep in the innovations of Moore, Byrne, Miller, Simonson and many others. There was a lot more diversity than we see today in the shrunken field, with Marvel and DC doing battle with dozens of smaller publishers like First, Comico, Renegade Press and more. One of my favorite outfits of the time was Eclipse Comics, who put out Miracleman, DNA Agents, Scout, and one of my most beloved rather underrated heroes, Michael T. Gilbert's Mr. Monster. Evil beware! Who: Doc Stearns is Mr. Monster, the latest in a long line of monster killers. Picture Buffy the Vampire Slayer crossed with Hellboy with a dash of the Punisher. Gilbert actually took the character from an obscure Canadian comic appearance or two in the 1940s, but he really made Mr. Monster his own, creating a detailed history and defining the blustery, monster-hating character. After a dozen or two of his own comics, Mr. Monster settled into a role as a "host" to many of Eclipse's reprints of weird comics from the 1940s and '50s, including what I fondly remember as my very first "3-D" comic. Why I dig: Gilbert's work is full of wit and charm, combining a kind of EC Comics campy gore and wit with some highly inventive layout and expressive Eisner-influenced art. Props also go to the essential lettering of Ken Bruzenak, which is like a secondary character in some of the stories. Gilbert's stories are highly tongue-in-cheek, with Mr. Monster and his spunky Girl Friday getting into all sorts of scrapes. A key to the stories is no matter how goofy they get, Mr. Monster remains an utterly serious hero, nearly fanatical in his pursuit of creatures of the night. There's not a lot of gray areas in the work, but a lot of clench-jawed charm. Sadly, Gilbert's monster-hunter has rarely been seen since the 1980s. There's been a few anthology series, but nothing sustained after the "Mr. Monster: Origins" miniseries that took a more serious spin on the Mr. Monster legend. Gilbert has gone on to do a lot of other comics work at Disney and DC but I wish he'd return to Mr. Monster -- there's a lot of great potential in this character yet. Read this: Sadly it's a bit of a hunt through back-issue bins to find much of the 30-year-old Mr. Monster comics. The 10-issue Eclipse series remains his highlight, although "Origins," which is considerably darker, is also quite solid. The best starting point though is this paperback which collects #1-5 of Doc Stearns' own series, including what I might have to pick as the single best Mr. Monster tale, "The Strange Story of Hemo Boy," featuring a little boy whose head is a bottle of blood (!!). It has a more sympathetic viewpoint than some of Mr. Monster's stories and combines pathos, wit and invention into a little, blood-soaked gem.